Introducing an exclusive offer for TeleDynamics dealers - see details below! You’re an installer. You’re on the front lines of ensuring that companies – large or small – have their telecommunications systems installed, scaled to the appropriate size, and working seamlessly. You’re part engineer, part salesperson, and a huge part problem-solver in the installing and maintaining of telephony systems. You’re actually putting together an intricate puzzle. But most installers don’t realize that a significant piece of that puzzle is missing. What inevitably happens is that a reluctant office admin gets drafted at the last minute to do the voicing of the greetings – or the end users themselves record their own names in the staff extension menu. Or – as it all too often happens – the installers are tasked with providing fill-in .wav files until a better solution is sourced. In all three scenarios, neither the admin, nor the staff members, nor the installer lists “professional IVR voicing” as their core competency. And this could make a big difference in how callers perceive your company. Neglecting to carefully consider your IVR voicing is like buying tiles at Home Depot but forgetting the grout. Professional telephone voices (like me, a 20-year veteran of IVR voicing, and heard on platforms for Cisco, Mitel, ShoreTel and Asterisk, among others) have the skillset derived from a full-time dedication to the writing, voicing, and editing of clean, professionally recorded phone prompts that provide a high level of professionalism while reflecting the personality and brand of the end user’s company. When you enlist the services of a voice talent dedicated to IVR voicing, you’re enjoying the advantage of professional gear, a soundproof environment, and the professional sound that comes from digital sound files delivered in the optimal format for your system. Also, mistakes and breathing noises are edited out, which is not possible with direct-into-phone recording. The company admin will be too busy with their own responsibilities to re-record the opening message every time a change needs to be made. Staff changes happen on a regular basis, and chances are, the office person drafted to voice the initial message will be too busy doing their own job to change the messages in a timely manner. Unless an IVR voice is available as part of the installer’s ongoing service contract, a phone system can end up being a jumble of a bunch of different voices – less than professional-sounding, to say the least. Think about the money and brainstorming that goes into the establishment of a company’s brand – from its website design and social media presence to its printed materials. Unfortunately, the phone system is often left out of that that cohesive brand messaging. And having a half-hearted and ill-thought-out execution of phone messages sends a message to callers: nobody cares enough about this company’s “entranceway” to have the greetings done professionally – and that’s how it does everything else. As telecom installers, having a built-in “voice of choice” shows a lot of foresight on your part, provides a necessary component to the professional and smooth execution of your customer’s install, and shows your customer that the effective and consistent projection of their brand matters to you – not just on install, but on an ongoing basis. My company, The IVR Voice.com, has struck up a partnership with TeleDynamics to provide professionally recorded IVR prompts to your end users. 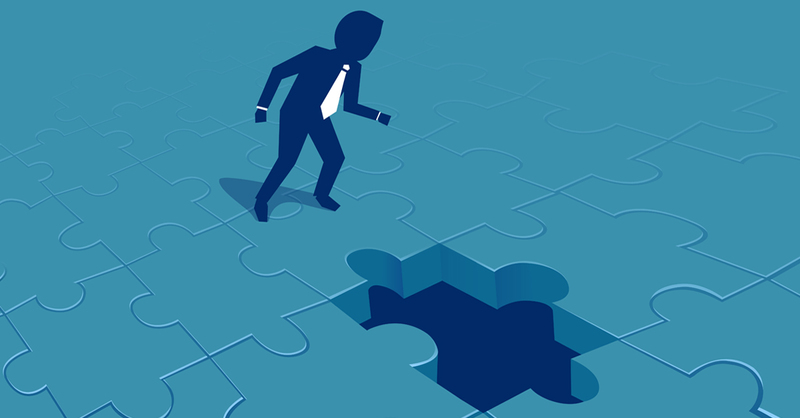 We provide same-day turnaround, competitive rates, and an ongoing commitment to excellence and reliability to provide that missing piece of the puzzle to all TeleDynamics installers. To assist you in educating your customers about the importance in having IVR done right, we’re offering a free opening greeting to your IP PBX end user, to showcase what we do and to illustrate what a dramatic difference professionally voiced IVR prompts can make to a company’s telephony presence. We predict your customers will embrace the idea, and will want their staff directories, after-hour messages, and on-hold programs professionally produced and maintained by The IVR Voice.com. 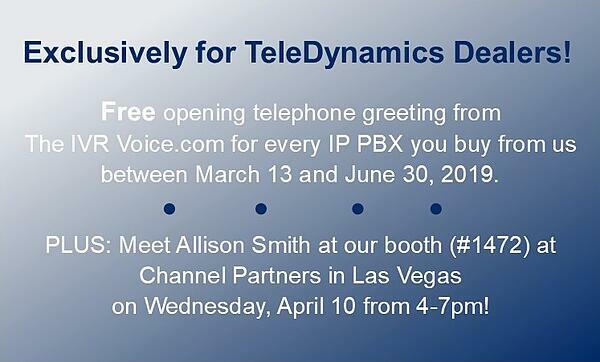 To take advantage of this offer, simply email your TeleDynamics invoice for an IP PBX along with your greeting script of 50 words or less to us at allison@theivrvoice.com. Limit one free greeting per IP PBX purchased from TeleDynamics between March 13 and June 30, 2019. Click here for tips on how to format the IVR greeting script. Allison Smith is an internationally-recognized professional voice talent, specializing in voicing telephone systems. She is the voice of Asterisk's default IVR system greetings, as well as of those of several other manufacturers. In this blog you'll read our thoughts on business telephone systems. While a lot has changed in telecom since TeleDynamics was founded in 1981, we remain as committed as ever to delivering the best customer service in the industry. If you would like elaboration on a specific topic, please let us know in the comments section. Copyright © 2019 TeleDynamics. All Rights Reserved.